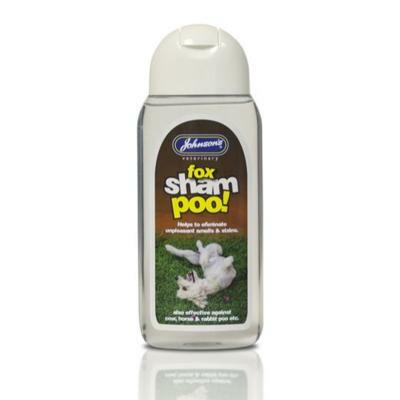 Johnsons Shampoo Effective Against Fox Poo and Other Smells. Johnsons shampoo for dogs has long been a favourite for pet owners throughout the many years Johnsons have been in business. This shampoo was brought to market to help solve the problem of dogs loving to roll themselves in less than pleasant substances e.g. fox poo, the aroma of which is very hard to remove totally and effectively. Johnson's shampoos are great value and very effective. Dilute the shampoo before use at a ratio of 30ml to 150ml of warm water. This shampoo cleans and deodorises the dog's coat and as it is enriched with Vitamin B5, it also conditions the coat. 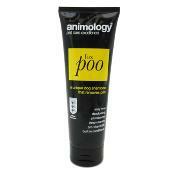 This shampoo helps to eliminate unpleasant smells as well as stains. It is not only effective against fox poo, it will also work on cow, horse and rabbit poo as well as other unpleasant odours your dog may manage to pick up. The scent of this shampoo is very fresh and clean, it would remind you of a fresh smelling shower gel scent. No more smelly dog to put up with!